As my faithful readers may know, I have a love of bread and pastries (specifically baguettes and tarte au citron). But not just any sort; bread and pastries are one of those items which are only worth eating when homemade, fresh and delicious. And Christmas is the best time to enjoy the best of the best. I enjoy visiting my favorite patisseries and depot de pain while in France, I also enjoy the tradition right here in Denver, Colorado. Far more rare but worth the extra miles to make the trip, the best ingredients make the best Christmas Goodies, and so seeking out your favorite local bakery is worth the investigative effort. This year I have a new bakery to add to the list. Les Delices de Paris is yummy, small and quaint, it is tucked away in a corner strip mall in Denver (600 S Holly St #101, Denver, CO 80246). You will be greeted by the owner with a French accent and delighted with the sights and tastes. Les Delices de Paris would be considered a traditional carry-out patisserie, specializing in cakes, tarts, quiches and delicious full butter croissants. I have my dear friend Olivia to thank for introducing me to this bakery. My traditional choice has been Trompeau Bakery, also in Denver, the smells smack you in the face at this place which specializes in breads and croissants. But Trompeau Bakery expanded to a much larger site two years ago and bigger is not always better, yet I am still a patron. They now bake bread for many of the local restaurants in and around Denver. In my opinion their pies, tarts and cakes don't match Les Delices De Paris, but the baguettes are good. The Pajama Baking Company (1595 S. Pearl St, Denver) also makes a tasty (if chewy) baguette and an excellent ciabatta bread. 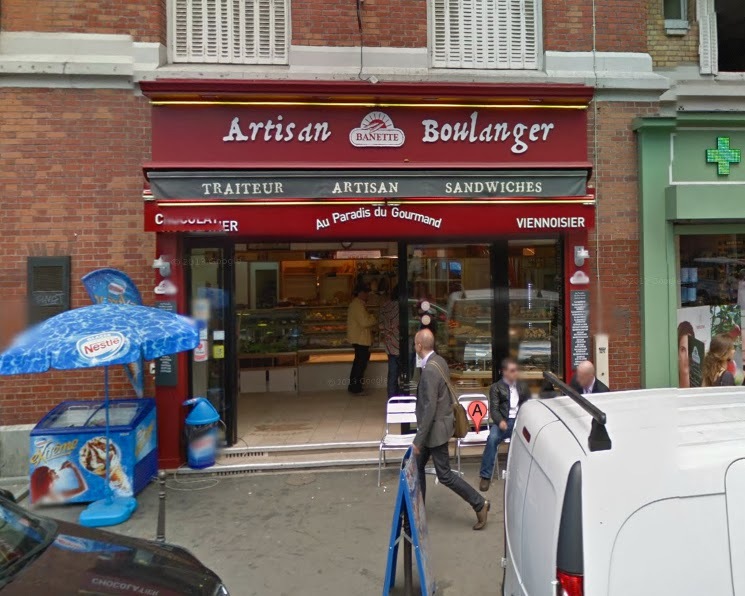 Again the quality might be the result of the specialties at a pâtisserie versus a boulangerie. 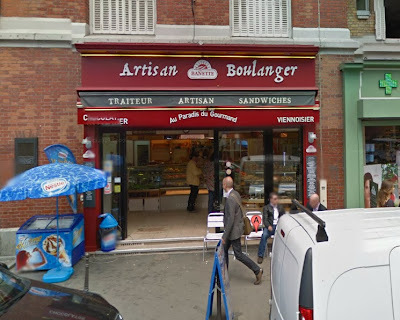 Boulangerie: a bakery where bread is sold. Pâtisserie: a bakery which specializes in pastries and sweets. Pâtisseries employ a master pastry chef with special credentials. Depot de pain: Bread Depots are locations in smaller towns where breads, baked off-site, are delivered daily for convenient pick-up by locals. 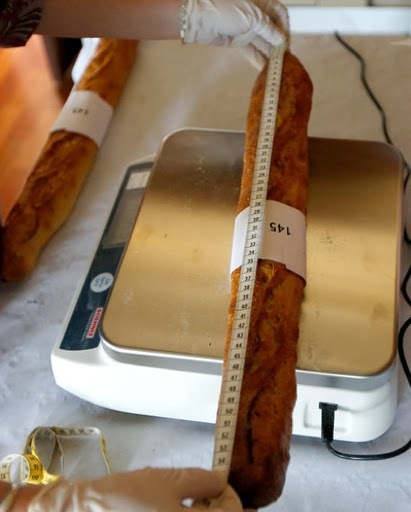 Preferences for taste in bread are highly personal, but the best baguettes are considered to be crispy on the outside and fluffy, soft and porous on the inside with a warm yeast smell. They should also be very very fresh. Good bread, without preservatives, is intended to be eaten the day it comes out of the oven. Here in Denver - we are a long way from being the best. Ridha Khadher (owner of Au Paradis du Gourmand, 156 Rue Raymond Losserand, Paris 75014 , 14e Arr.) recently won the coveted award of Best Baguette in Paris 2013. He may now bake his bread for the President of France for the next year. Did you know a true baguette should measure between 55-70cm long and fall within the acceptable weight of of 250-300g. 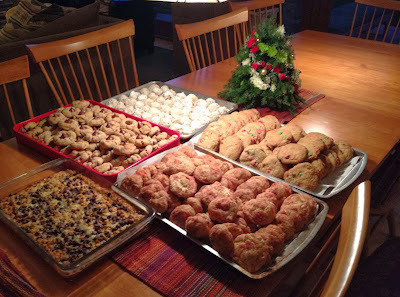 And now for our traditional Christmas goodies from America - good old fashioned home baked Christmas cookies. And my sister-in-law Missy's home baking. Nothing is better than a tray of homemade cookies.